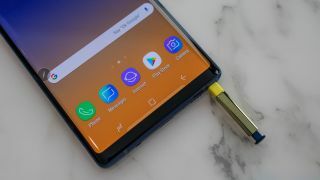 Samsung may replace all external buttons with capacitive pads on its upcoming Samsung Note 10 flagship phone, according to a report from South Korean outlet ETNews. Instead of physical buttons, you’ll press on the capacitive areas to fiddle with the volume or power; presumably, they will be in the same location on the upper edges of the phone’s sides. If this report is true, we wouldn’t be surprised if the Bixby button was similarly replaced, as it alleges Samsung is going for a “keyless” look. What’s more, Samsung will likewise swap out buttons for capacitive pads on some of its mid- and low-end phones in its lineup, like the Galaxy A series, industry sources told ETNews. Samsung wouldn’t be the first to pull off a buttonless experience: the Meizu Zero, a futuristic smartphone revealed in early 2019, is designed without buttons (or any charging cable/headphone port, for that matter). There’s no info on where or when that phone will be available to consumers, but it shows this latest Samsung rumor isn’t coming entirely out of left field. While this report is exciting, we remain wary...not of its prediction so much as the timeline. Exciting leaks of the past, like the in-screen fingerprint sensor, were tipped for much earlier Samsung smartphones. The tech just debuted in the Samsung Galaxy S10 lineup, but was predicted to come in the Samsung Galaxy Note 9, and the Galaxy S9 before that and the Note 8 before that and the S8 before that. Samsung may be working on this idea behind closed doors, but there's no telling if the Note 10 will be the first Galaxy phone with this feature. Get hyped for the heavens: TechRadar's Space Week has begun!